There’s a performance on the west coast that’s making royal what has historically been deemed irresponsible. welfareQUEENS is a play that debuted last April in San Francisco, according to the website, Poor Magazine Online. The play challenges the stereotyping of black and Latino single mothers lazily filling up welfare rolls to take care of their umpteen amount of children. 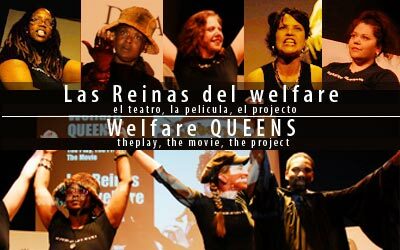 Through intentional use of the highly problematic objectifying label/stereotype of ‘welfare queen’, originally coined by Ronald Reagan as an extremely derogatory reference to poor mothers who were receiving cash aid from Aid to Families with Dependent Children (AFDC), the welfare QUEENS project will re-contextualize the word and who it refers to in the framework of a post welfare reform, increasing stratified American society. This society makes it illegal to be poor; this society does not recognize, support or legitimize the “work” involved in raising children; and this society is quick to accuse poor mothers of the crime of being poor rather than recognize the heroism of their survival. And the goal of the play isn’t to be preachy. The script was written by, and the cast staring have all been on welfare, or struggled as working poor. The team is headed by long-time Bay Area activist and journalist, Lisa Gray-Garcia, author of the memoir, Criminal of Poverty – Growing up Homeless in America. The California State University’s Center for the Study of Gender and Sexuality will host a forum on the the myth of the black welfare queen on Nov. 27. See the listing below for details. The Myth of the Welfare Queen: Women of Color and Poverty in L.A. This panel of welfare scholars and local activists explore women of color and poverty rates in Los Angeles, the effects of the 1996 welfare reform legislation that ended welfare as we know it, and how “welfare to work” programs contribute to the cycle of poverty in the U.S.
More Information: Call the Cross Cultural Centers at (323) 343-5001 for more information. For those out there who attend, fill in us by having your say below.